DURHAM — While some hope to capitalize on a new scenic byway that stretches 12 miles in four communities, others are wary of the impact of regional influence. During a biannual meeting May 8, members of the New Hampshire Scenic and Cultural Byway Council unanimously approved the Mills Scenic Byway and included it into the state’s Scenic and Cultural Byway Program. The Mills Scenic Byway travels through downtown Newmarket, Durham, and Madbury along Route 108. As Dover declined to participate in the process, the byway continues along Route 4, Roberts Road, Main Street and Front Street in Rollinsford. The byway will help highlight the historical mills — which are being converted into housing, business and local centers — in the communities, according to Kyle Pimental, senior regional planner with Strafford Regional Planning Commission (SRPC). Pimental said some Dover residents expressed concerns that the designation would bring about a loss of local control. This entry was posted in Rockingham, Strafford on May 18, 2014 by Admin. 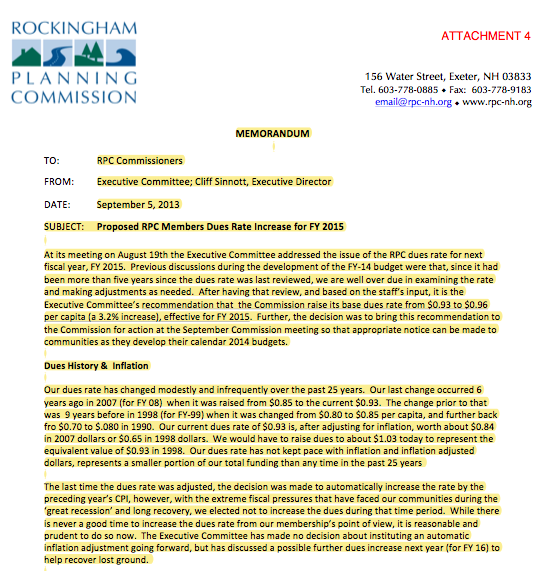 The Rockingham Regional Planning Commission is looking to increase the rate that taxpayers pay to fund their activities. It is likely that the other 8 RPCs will be looking for increasing rates as well. We find this ironic since this money is used to obtain grants from the HUD/DOT/EPA to further curtail you property, water, travel and educational rights in New Hampshire and increase your taxes at the same time. We also suspect that money from the Nashua RPC was used to pay a lawyer for advice on how to squelch public discussion of and dissemination of the public domain products of this taxpayer-funded statewide effort. Taxpayers should protest to their local planning and selectboards to stop this increase and to stop paying dues altogether. It is not a requirement for a town to pay dues to these unelected commissions. This entry was posted in Rockingham on September 9, 2013 by Admin.